The main aim of the home is to provide a caring, comfortable homely environment where all the residents can develop to their fullest potential. The residents are all encouraged to contribute the general running of the home to the best of their abilities. They all have special tasks, which they have chosen to do and are helped to perform them. Most of the time it would be quicker, easier and more efficient if the staff performed these duties themselves but we firmly believe in encouraging independence and a feeling of worth though contributing to the daily routine in the running of the home. 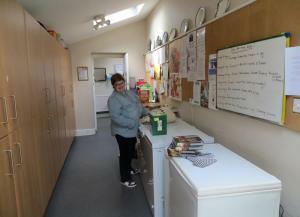 The residents keep their own rooms tidy, make their own beds, dust, wash dishes, lay and clear tables, prepare snacks and drinks, empty bins, help with the laundry, vacuuming and many other essential jobs. These all help to give them a sense of purpose and responsibility. We hold a residents meeting every 2-3 months or whenever the need should arise, our residents get the opportunity to discuss any issues they may have, or even just to let us know what they would like to see on the menus. The Hill Road shopping area is within walking distance. Layde bay is 100yds from the property with its own pebble beach and steps leading to it. We have our own transport to enable the resident's access to the local community when needed. There is a bus stop at the end of the road, we support our residents to apply for a bus pass and encourage them to use the buses to promote independence. Provide a caring, comfortable environment where all residents can develop to their fullest potential. 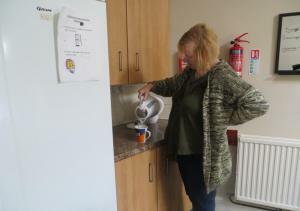 Provide staff who are trained to recognise resident's needs and help them achieve maximum independence. Encourage and help resident's to take an active part in the running of the home. Run regular resident's meetings to give them a voice and an opportunity to take part in decision making. Encourage the use of public facilities. Be an enabling environment which encourages choice. To help resident's pursue existing hobbies and take up new ones. Provide a wide range of social activities which people can enjoy.